Based on historical trends, a climate change policy environment of delayed/ineffective proactive action followed by a somewhat desperate reactive push towards rapid decarbonization appears to be the most likely scenario. It is important to re-emphasize right at the start of this article that CCS is only a viable option if climate change is a significant factor. If it eventually turns out that long-term CO2 concentrations of 850 ppm are perfectly fine, we can drop all CCS research right now. If 650 ppm is acceptable, I would be satisfied with the current rate of progress. However, if 450 ppm indeed remains a priority, the role of CCS will probably expand dramatically over the next decade or two. This series of articles is written on the assumption that the world will manage to, in some way or another, restrict long-term atmospheric CO2 concentrations somewhere in the range of 450-550 ppm. Based on historical CO2 emissions data and climate change policy developments, the most likely scenario appears to be one of delayed/ineffective proactive action followed by a somewhat desperate reactive push towards rapid decarbonization. This is the policy scenario in which CCS will do the best and is also the subject of this article. Aside from the possibility of another global financial crisis, the chances that emissions dip significantly below the New Policies profile before 2017 appears to be almost zero. This implies that adherence to the 450 ppm scenario will require that the entire world ceases all construction of fossil fuel infrastructure by 2017 (completely impossible) or commit to retiring ever increasing amounts fully functional fossil fuel infrastructure prematurely and replacing it with alternatives that will probably be substantially more expensive and less practical (probably politically impossible). Given these numbers, the chances that we meet the 450 ppm target while maintaining the rapid industrialization desired by 6 billion developing world citizens (illustrated below) appear very small indeed. For example, China is still rapidly expanding its domestic coal production and planning to curb air pollution by constructing even more CO2-intensive coal-to-gas plants. And then there is also India which will soon be more populous than China as well as many other populous developing countries such as Brazil and Indonesia. The chances are therefore high that we reach the end of this decade having already locked in all CO2 emissions allowable in the 450 ppm scenario and still rapidly building more long-lived fossil fuel infrastructure. If climate change effects start to become significantly more frequent and severe by that time, we may just start to witness a clear shift from current ineffective technology-forcing policies to a widespread technology-neutral policy environment targeted directly at CO2 abatement. A belated reactive push towards rapid decarbonization will probably be driven by a rapid increase in CO2 prices. If the 450 ppm scenario is confirmed as a global priority early in the next decade, it is fully possible that global average CO2 prices jump from close to zero in 2020 to as high as $100/ton in 2030. As an example, the IEA foresees CO2 prices around $90/ton in 2030 with continued increases thereafter if the 450 ppm scenario is to be met (shown below). Such a large jump in CO2 prices will completely reshape the energy market. The effective price of coal will jump from below $100/ton today to more than $300/ton. Coal-fired electricity will increase from below $60/MWh today to about $150/MWh. Oil will see somewhat smaller price increases, while the price jump for gas will be about half as severe. 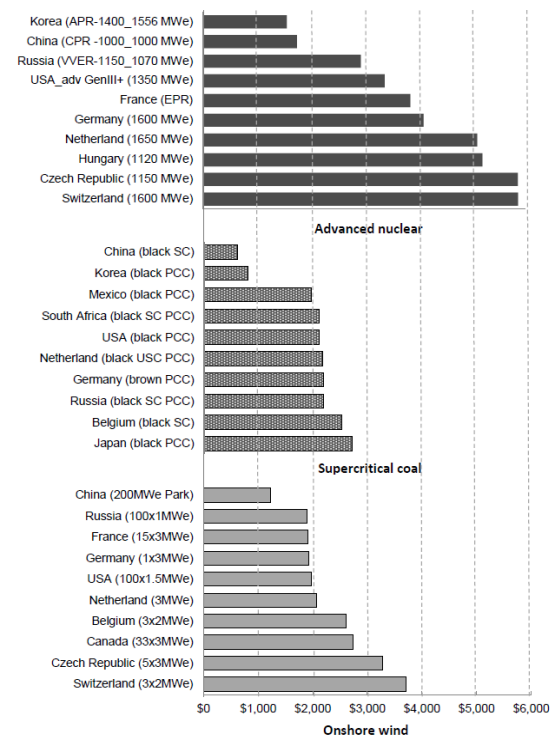 In China and other developing nations where the bulk of the global coal fleet is located, the choice will be between retrofitting existing plants for about 50% of the original plant value, building nuclear plants for 200-300% of the original plant value or building (intermittent) wind farms for about 700% of the original plant value (when adjusted for capacity factor) (see below). Another very important factor is that the retrofit option avoids all the economic and social turmoil created by forced capital writedowns not only of the plants themselves, but throughout the entire coal mining industry. When rapid change is enforced on the market through a very high CO2 price, the 4-10 times lower capital expenditures and the effective utilization of sunk investments from the CCS retrofit strategy will clearly be the best option. Yes, CCS will involve substantial fuel costs which are not applicable to nuclear and wind, but the rapidly rising CO2 price will value low capital costs and rapid deployment very highly. Capital costs are a good indication of the amount of time, materials, energy and expertise required to construct an operating plant. Thus, if deployment of low-carbon energy is left to capital-intensive nuclear and wind, rapid decarbonization will simply not be possible and the CO2 price will rise so high that it forces reductions in CO2 emissions through economic contraction rather than technology deployment. And if the economy starts contracting, our ability to achieve a technology-led decarbonization will be greatly reduced. When also considering the economic pain brought by large scale capital write-downs and the fact that we are only talking about the power sector here, rapid decarbonization through capital intensive nuclear and renewable energy technologies appear to be clearly unfeasible. In this case, we will have to compromise on our climate commitments and aim for a more realistic target – say 650 ppm (the New Policies scenario in the table above) – in order to reduce the CO2 price. Such a scenario could allow for a nuclear/renewables-led decarbonization of the power sector with CCS being deployed primarily in industry, but, if climate science is correct, could activate self-strengthening climate feedback loops which can be truly disastrous in the long term. When saying that rapid decarbonization through CCS will be substantially easier than rapid decarbonization through nuclear and/or renewables, I certainly do not wish to imply that it will be easy. Vaclav Smil gives a good analogy on the scale of the problem by stating that the storage of only 20% of global CO2 emissions (around 6 Gt/year) will require that we pump down a volume of CO2 that is twice the volume of oil that we pump up every year. He then goes on to say that, since we took an entire century to build up the oil industry to pump all this volume up, CCS, which will require substantially larger volumes to be pumped down, is unlikely to have a sizable impact. He also states the fact that we will have to pay for the pumping down of CO2 though taxation as a major show-stopper. However, if real world climate change impacts force a commitment to a 450 ppm or 550 ppm target, causing a global CO2 price to quickly rise above $50/ton and beyond, the outlook will change totally. Such a situation will create an enormous demand for CO2 storage services simply because CO2 can be captured and compressed for $30/ton or less and will be worth $50/ton or more if successfully stored. 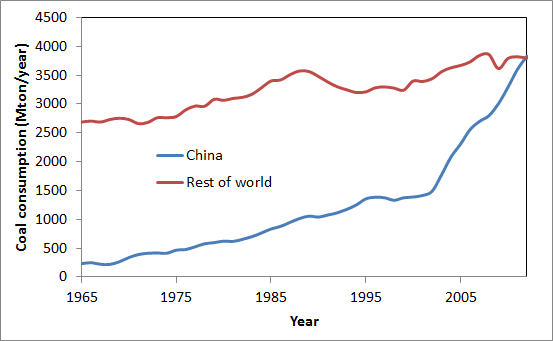 Consider that China alone could expand its yearly coal consumption by 2300 Mt (about 30% of current global consumption) in only the last decade (see below). 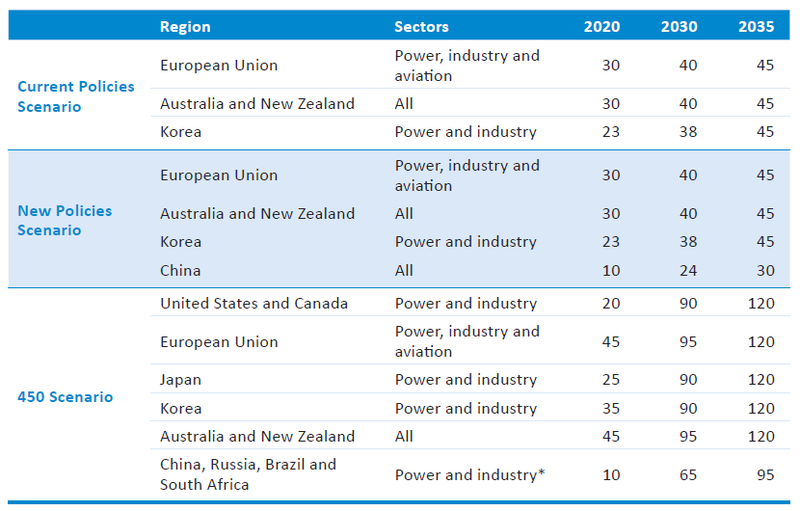 This is truly remarkable: one country which represents about 12% of global GDP could build out a third of global coal infrastructure in a single decade. It can be conservatively estimated that capturing, transporting and storing CO2 will be roughly half as expensive as mining, transporting and productively utilizing coal (e.g. currently available CCS technology will increase the LCOE of coal-fired electricity in the US by about 35%). This implies that China, if the market demands it, could potentially scale up CCS twice as fast as they scaled up coal production. In the video above, Vaclav Smil also alludes to what could well be the primary headwind facing CCS deployment in a strong technology-neutral CO2 abatement policy framework: NIMBYism. It will therefore be up to the CCS industry to thoroughly demonstrate and clearly communicate the safety of CO2 transport and storage. If this is not successfully done, CCS could underperform in a similar manner to nuclear at present. That being said, however, correct CO2 market design enforcing an emissions pathway towards a 450-550 ppm target will impose such enormous price pressures on the population that NIMBYism may very well become a significantly smaller issue than expected. If the world ever commits to an atmospheric CO2 target of 450-550 ppm and economic growth can be maintained against the wide range of headwinds that have persisted since the 2008 crisis, a very strong technology-neutral climate change mitigation policy framework is likely to emerge in the next decade. Such a framework, spearheaded by a high and rising price on CO2, will lead to very rapid deployment of CCS. Growth will stem from a need to protect large investments in unabated fossil fuel infrastructure, from the need to reduce direct industrial emissions, and from the capital-intensive nature of nuclear and renewable alternatives. CCS should be able to scale up very quickly in such a policy environment, but could face substantial resistance from NIMBYism. It is therefore up to the CCS industry to demonstrate and communicate the safety of CO2 transport and storage in a highly effective manner in order to proactively mitigate this potentially large headwind.